Formerly known as the Painting School at the Goetheanum, we offer a full and part-time training in artistic and therapeutic painting based on the new impulses given by Dr. Rudolf Steiner (1861-1925), and on the colour research of the painter Gerard Wagner (1906-1999) who spent a lifetime working out of Rudolf Steiner’s indications. 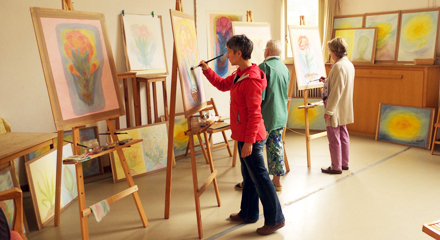 The painting school is open to anyone wishing to take part in painting classes for a shorter or longer period. This can take the form of a short meeting with a method of working that can give a burst of inspiration for further artistic work, or it can become a painting training lasting between one and four years. The course will explore R.Steiner’s indication for painting on coloured backgrounds, and how this can influence objectively the arising of form ‘out of the colour’. Monday, July 30th, 2018, 5:00 p.m., to Saturday, August 4th, 4:00 p.m.
How form arises from color, we shall investigate through painting, under the guidance of Caroline Chanter, director of the Rudolf Steiner Malschule. We shall use watercolors made from plants. How color arises from the colorless, we shall investigate by physics experiments. My key motivation for returning is to learn more about how to apply Rudolf Steiner’s instructions on colour, and how he saw art. The approach offered at the school is based on Gerard Wagner’s own research and studies of these instructions. This helps me as a painter to explore and experiment more with a view to developing my own feeling abilities with colours. I was looking for a way of re-connecting to the original painting indications of Rudolf Steiner rather than simply following the traditions established by practising artists therapists and teachers since his death. I found that the teaching provided by Caroline Chanter fulfilled this aspiration as everything is based upon a direct experience of what the colours themselves ask of us. My year at the painting school has given me a profound experience of art, color, nature, the cosmos and of my own self, for which I am thankful. The painting approach itself is very human, a way of life. I can say that by working in this method I am truly engaged in creative activity and that it helps wake me up to my humanity. Painting with plant-based pigments forms the main part of the training while the study of Rudolf Steiner's lectures on art and colour are the basis for the study periods. Copyright © 2017 Rudolf Steiner Malschule. German Translation by Margot Saar.